In this study, we conducted a systematic review and meta-analysis of association studies to evaluate whether peripheral blood glutamate levels differed between MDD patients and controls. Eligible studies were identified in September 2017 with PubMed and Scopus databases, using the keywords (“Major depressive disorder” OR “depression” OR “depressive disorder”) AND (“glutamate” OR “glutamic acid”) AND (“serum” OR “plasma”). We also conducted an additional manual search of reference lists in the included publications. Studies meeting the following criteria were included for further meta-analysis: 1) studies assessing peripheral blood (serum or plasma) glutamate levels; 2) studies comparing glutamate levels in MDD patients and control subjects; and 3) studies written in English. Three reviewers (Inoshita M, Tomioka Y, and Watanabe SY) selected the articles independently according to the inclusion criteria. The flow chart of the present study’s selection is shown in Figure S1. The following data were extracted from eligible studies: ethnicity, sample size, gender distribution, mean age, mean glutamate concentrations and SD, unit of measure, blood sampling, glutamate assay, medication use, and diagnostic criteria. Statistical analyses were performed with the “metafor” package in R (version 3.2.3). 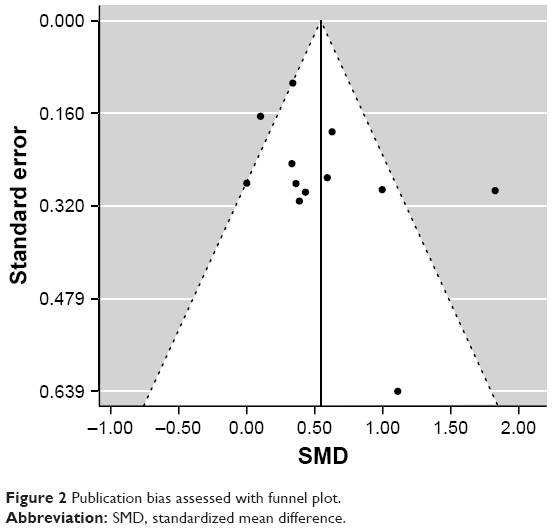 A meta-analysis of association studies was performed on standardized mean differences (SMD) using the data of sample size and mean and SD of glutamate concentration.32,33 When the data were presented as a subgroup, we combined these data into one group and calculated the composite mean using the formula: Composite mean where n(i) was the sample size of ith group, M(i) was the mean of ith group, k was the number of groups, and N was the overall sample size; and composite variance using the formula: Composite variance = (ess+gss)/(N−1), where ess was the overall error sum of squares and gss was the overall group sum of squares. When the data were presented as median and interquartile range, we calculated the mean and SD.34 When the data were presented with standard error (SE) of the mean, we calculated the SD as √n×SE, where n was the sample size. Heterogeneity across studies was quantified with the I2 statistic, with 25%, 50%, and 75% indicating small, moderate, and high levels of heterogeneity, respectively.35 If heterogeneity across studies was found, then an inverse-weight variance random-effects model was applied; otherwise, a fixed-effects model was applied. Publication bias was assessed using a regression test for funnel plot asymmetry.36 The influence of each selected study on the outcome was assessed using a leave-one-out sensitivity analysis.37 Subgroup analyses were performed on the basis of blood sampling (plasma or serum), glutamate assay (high-performance liquid chromatography [HPLC] or mass spectroscopy), medication use, fasting or nonfasting sample, and ethnicity (Asian or non-Asian). Meta-regression analysis was performed to examine the effects of age, gender (% male), medication exposure (% medication-received patients), sample size, and published year. Abbreviations: MDD, major depressive disorder; CTRL, control; HPLC, high-performance liquid chromatography; DSM, Diagnostic and Statistical Manual of Mental Disorders; LC-MS/MS, liquid chromatography–tandem mass spectrometry; CE-TOFMS, capillary electrophoresis-time-of-flight mass spectrometry. 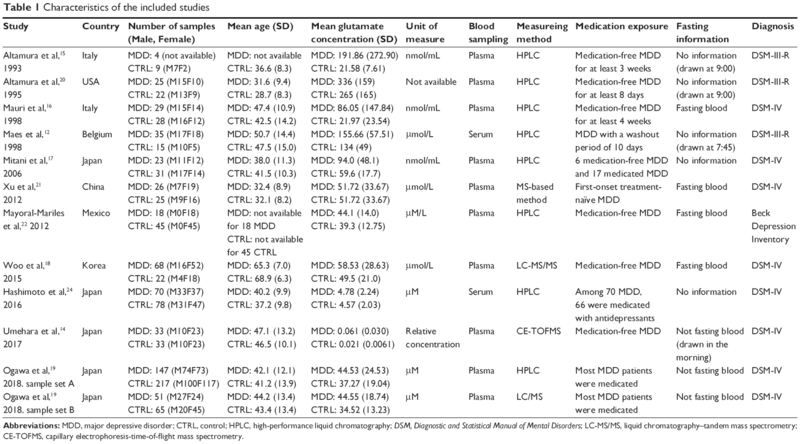 When we conducted a meta-analysis of these 12 association studies between blood glutamate levels and MDD from 11 studies in a total of 529 patients with MDD and 590 control participants, a random effects model showed that blood glutamate levels were significantly higher in patients with MDD than in controls, with high heterogeneity (SMD=0.54, 95% CI=0.27–0.82, p=8.5×10−5, I2=75.0%, p<0.05, Figure 1). A funnel plot analysis indicated no evidence of publication bias in the association studies (p>0.05, Figure 2). A leave-one-out sensitivity analysis indicated our result was not driven by any single study (p<0.05, Table S1). 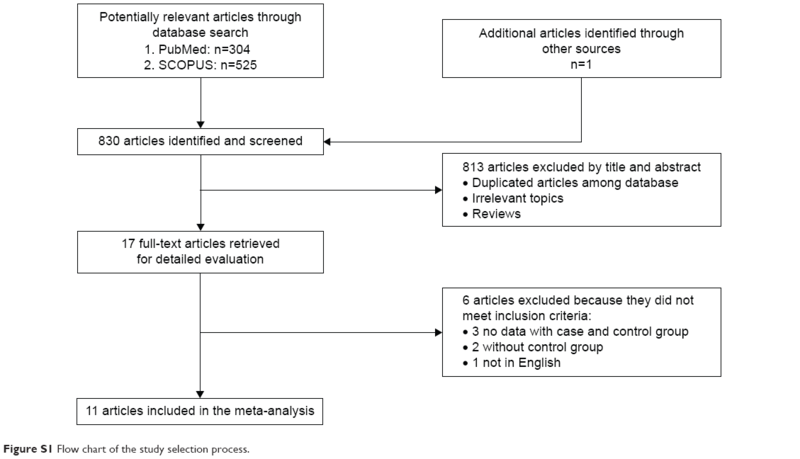 Figure 1 RE meta-analysis of association studies between peripheral blood glutamate levels and MDD. Abbreviations: RE, random effect; MDD, major depressive disorder; SMD, standardized mean difference. Figure 2 Publication bias assessed with funnel plot. Abbreviation: SMD, standardized mean difference. We conducted subgroup analyses according to blood sampling, glutamate assay, medication use, fasting or nonfasting sample, and ethnicity (Table 2). The pooled SMD from 10 plasma14,15–22 and 2 serum studies12,24 was 0.62 (95% CI=0.31–0.93, p=1.0×10−4, I2=75.9%, p<0.05) and 0.16 (95% CI=−0.12–0.45, p=0.26, I2=0%, p=0.42), respectively. The pooled SMD from 8 studies using HPLC assay12,15–17,19–20,22,24 and 4 studies using MS14,18,19,21 was 0.41 (95% CI=0.22–0.60, p<1.0×10−4, I2=28.5%, p=0.22) and 0.69 (95% CI=−0.069–1.45, p=0.075, I2=89.7%, p<0.05), respectively. The pooled SMD from 8 studies using medication-free samples12,14–16,18,20–22 was 0.59 (95% CI=0.19–1.00, p=4.0×10−3, I2=72.9%, p<0.05). The pooled SMD from 4 studies using fasting samples16,18,21,22 and 3 studies using nonfasting samples14,19 was 0.33 (95% CI=0.063–0.59, p=0.015, I2=0%, p=0.51) and 0.90 (95% CI=0.031–1.77, p=0.042, I2=94.1%, p<0.05), respectively. The pooled SMD from 7 Asian studies14,17–19,21,24 and 5 non-Asian studies12,15,16,20,22 was 0.58 (95% CI=0.14–1.02, p=0.01, I2=88.6%, p<0.05) and 0.48 (95% CI=0.21–0.76, p=6.0×10−4, I2=0%, p=0.84), respectively. Abbreviations: MDD, major depressive disorder; SMD, standardized mean difference; HPLC, high-performance liquid chromatography; MS, mass spectroscopy. When we conducted a meta-regression analysis to examine the effects of age, gender, medication use, sample size, and published year on the glutamate levels, we found no effects of these variables on blood glutamate levels (p>0.05) (Table 3). 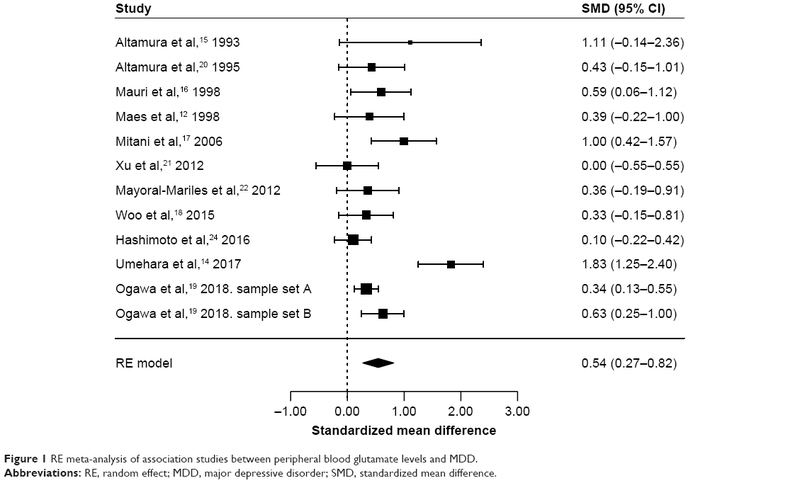 This is the first systematic review and meta-analysis of association studies between peripheral blood glutamate levels and MDD, and we demonstrated elevated glutamate levels in MDD in the pooled data set (529 patients with MDD and 590 controls). A high level of heterogeneity was observed in this meta-analysis of all studies (I2=75.0%). To examine the sources of potential heterogeneity, we subsequently conducted subgroup analyses and a meta-regression analysis. In the subgroup analyses, we classified studies into those that involved the use of glutamate assays (HPLC or mass spectroscopy) and those that involved food consumption (fasting or nonfasting). We also classified studies into groups based on ethnicity (Asian or non-Asian). We revealed significantly elevated glutamate levels in MDD with remarkably reduced levels of heterogeneity when we considered studies that involved only HPLC assays (SMD=0.41 and I2=28.5%), only fasting samples (SMD=0.33 and I2=0%), and only non-Asian samples (SMD=0.48 and I2=0%). These results suggest that the differences of glutamate assay, food consumption, and ethnicity might contribute to the heterogeneity observed in this study. On the other hand, subgroup analysis using studies involving medication-free samples showed significantly elevated glutamate levels in MDD without reduction of heterogeneity level (I2=72.9%). However, these results from our subgroup analyses must be viewed with caution because of the small sample size. In the meta-regression analysis, we found no significant effects of age, gender, medication exposure, sample size, and publication year on blood glutamate levels in MDD patients. However, a significant decrease in blood glutamate levels has been reported in MDD after treatment with antidepressants.11,12 Besides, a recent study showed significant positive correlations of daily doses of benzodiazepine derivatives and antidepressants with plasma glutamate levels in MDD patients.19 These studies suggest that medications, such as antidepressants and benzodiazepines, may affect blood glutamate levels in MDD patients. In this meta-regression analysis of medication exposure, the sample size was small (only two studies17,24 out of ten used medicated MDD samples), and we were unable to analyze the effect of medication in detail due to insufficient information on drugs used in these included studies. Further studies assessing the effects of medication on blood glutamate levels according to types and dosages of antidepressants will be needed. Our study has several limitations. First, the sample size was relatively small. Second, there was high heterogeneity among the studies in this meta-analysis. Larger studies with detailed information on participants, such as severity of symptoms, existence of psychosis, types of antidepressants and doses, and metabolic parameters, will be needed to validate our findings and reveal hidden factors that could explain the heterogeneity. Finally, it is still unclear whether peripheral blood glutamate levels can reflect brain levels of glutamate in MDD. Shulman et al38 examined the relation between plasma and medial prefrontal cortical glutamate levels in healthy male volunteers, and they found no correlation between them. However, they measured glutamate levels in the limited brain region, and they assessed glutamate levels of healthy subjects, not patients with MDD. Further studies will be needed to examine this relationship between them. We conducted a systematic review and meta-analysis of association studies between peripheral blood glutamate levels and MDD, and we demonstrated elevated blood glutamate levels in MDD. Our findings suggest that changes in glutamate levels may be implicated in MDD and provide further support for the glutamatergic dysfunction hypothesis of MDD. This work was supported in part by Japan Agency for Medical Research and Development, AMED (Tetsuro Ohmori), Grant-in-Aid for Scientific Research (C) (No 15K09809) (Shusuke Numata), and Grant-in-Aid for Young Scientists (B) (No 16K19769) (Shin-ya Watanabe). Shusuke Numata designed the study. Tetsuro Ohmori and Shusuke Numata managed the research. Masatoshi Inoshita, Yukiko Tomioka, and Shin-ya Watanabe collected the data. Makoto Kinoshita, Masahito Nakataki, Atsushi Tajima, and Hidehiro Umehara undertook the statistical analysis. Masatoshi Inoshita, Masahito Nakataki, and Shusuke Numata wrote the draft. All authors contributed toward data analysis, drafting and critically revising the paper and agree to be accountable for all aspects of the work. Kessler RC, Berglund P, Demler O, et al. National Comorbidity Survey Replication. The epidemiology of major depressive disorder: results from the National Comorbidity Survey Replication (NCS-R). JAMA. 2003;289(23):3095–3105. Dean J, Keshavan M. The neurobiology of depression: an integrated view. Asian J Psychiatr. 2017;27:101–111. Hashimoto K. Emerging role of glutamate in the pathophysiology of major depressive disorder. Brain Res Rev. 2009;61(2):105–123. Murrough JW, Abdallah CG, Mathew SJ. Targeting glutamate signalling in depression: progress and prospects. Nat Rev Drug Discov. 2017;16(7):472–486. Mlyniec K. Zinc in the glutamatergic theory of depression. Curr Neuropharmacol. 2015;13(4):505–513. Duman RS. Neuronal damage and protection in the pathophysiology and treatment of psychiatric illness: stress and depression. Dialogues Clin Neurosci. 2009;11(3):239–255. Hashimoto K. The role of glutamate on the action of antidepressants. Prog Neuropsychopharmacol Biol Psychiatry. 2011;35(7):1558–1568. Tokita K, Yamaji T, Hashimoto K. Roles of glutamate signaling in preclinical and/or mechanistic models of depression. Pharmacol Biochem Behav. 2012;100(4):688–704. Küçükibrahimoğlu E, Saygin MZ, Calişkan M, et al. The change in plasma GABA, glutamine and glutamate levels in fluoxetine- or S-citalopram-treated female patients with major depression. Eur J Clin Pharmacol. 2009;65(6):571–577. Maes M, Verkerk R, Vandoolaeghe E, et al. Serum levels of excitatory amino acids, serine, glycine, histidine, threonine, taurine, alanine and arginine in treatment-resistant depression: modulation by treatment with antidepressants and prediction of clinical responsivity. Acta Psychiatr Scand. 1998;97(4):302–308. Romeo B, Choucha W, Fossati P, et al. Meta-analysis of short- and mid-term efficacy of ketamine in unipolar and bipolar depression. Psychiatry Res. 2015;230(2):682–688. Umehara H, Numata S, Watanabe SY, et al. Altered KYN/TRP, Gln/Glu, and Met/methionine sulfoxide ratios in the blood plasma of medication-free patients with major depressive disorder. Sci Rep. 2017;7(1):4855. Altamura CA, Mauri MC, Ferrara A, et al. Plasma and platelet excitatory amino acids in psychiatric disorders. Am J Psychiatry. 1993;150(11):1731–1733. Mauri MC, Ferrara A, Boscati L, et al. Plasma and platelet amino acid concentrations in patients affected by major depression and under fluvoxamine treatment. Neuropsychobiology. 1998;37(3):124–129. Mitani H, Shirayama Y, Yamada T, et al. Correlation between plasma levels of glutamate, alanine and serine with severity of depression. Prog Neuropsychopharmacol Biol Psychiatry. 2006;30(6):1155–1158. Woo HI, Chun MR, Yang JS, et al. Plasma amino acid profiling in major depressive disorder treated with selective serotonin reuptake inhibitors. CNS Neurosci Ther. 2015;21(5):417–424. Ogawa S, Koga N, Hattori K, et al. Plasma amino acid profile in major depressive disorder: analyses in two independent case-control sample sets. J Psychiatr Res. 2018;96:23–32. Altamura C, Maes M, Dai J, et al. Plasma concentrations of excitatory amino acids, serine, glycine, taurine and histidine in major depression. Eur Neuropsychopharmacol. 1995;(5 Suppl):71–75. Xu HB, Fang L, Hu ZC, et al. Potential clinical utility of plasma amino acid profiling in the detection of major depressive disorder. Psychiatry Res. 2012;200(2–3):1054–1057. Mayoral-Mariles A, Cruz-Revilla C, Vega-Manriquez X, et al. Plasma amino acid levels discriminate between control subjects and mildly depressed elderly women. Arch Med Res. 2012;43(5):375–382. Lu YR, Fu XY, Shi LG, et al. Decreased plasma neuroactive amino acids and increased nitric oxide levels in melancholic major depressive disorder. BMC Psychiatry. 2014;14:123. Hashimoto K, Yoshida T, Ishikawa M, et al. Increased serum levels of serine enantiomers in patients with depression. Acta Neuropsychiatr. 2016;28(3):173–178. Hashimoto K, Sawa A, Iyo M. Increased levels of glutamate in brains from patients with mood disorders. Biol Psychiatry. 2007;62(11):1310–1316. Sanacora G, Gueorguieva R, Epperson CN, et al. Subtype-specific alterations of gamma-aminobutyric acid and glutamate in patients with major depression. Arch Gen Psychiatry. 2004;61(7):705–713. Arnone D, Mumuni AN, Jauhar S, et al. Indirect evidence of selective glial involvement in glutamate-based mechanisms of mood regulation in depression: meta-analysis of absolute prefrontal neuro-metabolic concentrations. Eur Neuropsychopharmacol. 2015;25(8):1109–1117. Levine J, Panchalingam K, Rapoport A, et al. Increased cerebrospinal fluid glutamine levels in depressed patients. Biol Psychiatry. 2000;47(7):586–593. Hashimoto K, Bruno D, Nierenberg J, et al. Abnormality in glutamine-glutamate cycle in the cerebrospinal fluid of cognitively intact elderly individuals with major depressive disorder: a 3-year follow-up study. Transl Psychiatry. 2016;6:e744. Frye MA, Tsai GE, Huggins T, et al. Low cerebrospinal fluid glutamate and glycine in refractory affective disorder. Biol Psychiatry. 2007;61(10):162–166. Garakani A, Martinez JM, Yehuda R, et al. Cerebrospinal fluid levels of glutamate and corticotropin releasing hormone in major depression before and after treatment. J Affect Disord. 2013;146(2):262–265. Nishi A, Numata S, Tajima A, et al. Meta-analyses of blood homocysteine levels for gender and genetic association studies of the MTHFR C677T polymorphism in schizophrenia. Schizophr Bull. 2014;40(5):1154–1163. Tomioka Y, Numata S, Kinoshita M, et al. Decreased serum pyridoxal levels in schizophrenia: meta-analysis and Mendelian randomization analysis. J Psychiatry Neurosci. 2018;43(2):170053. Wan X, Wang W, Liu J, et al. Estimating the sample mean and standard deviation from the sample size, median, range and/or interquartile range. BMC Med Res Methodol. 2014;14:135. Higgins JP, Thompson SG, Deeks JJ, et al. Measuring inconsistency in meta-analyses. BMJ. 2003;327(7414):557–560. Egger M, Davey Smith G, Schneider M, et al. Bias in meta-analysis detected by a simple, graphical test. BMJ. 1997;315(7109):629–634. Patsopoulos NA, Evangelou E, Ioannidis JP. Sensitivity of between-study heterogeneity in meta-analysis: proposed metrics and empirical evaluation. Int J Epidemiol. 2008;37(5):1148–1157. Shulman Y, Grant S, Seres P, et al. The relation between peripheral and central glutamate and glutamine in healthy male volunteers. J Psychiatry Neurosci. 2006;31(6):406–410. Figure S1 Flow chart of the study selection process.